Tomorrow, we are heading back to Linvilla Orchards to cut down our Christmas tree! This place is sooooo great. If you're not in the holiday spirit before you get there, then you will be. They have hayrides out to the Christmas tree farm, hot chocolate, reindeer, a fire for roasting marshmallows, a little shop with homemade deliciousness and crafty holiday decorations... and did I mention reindeer? It's just beautiful! They're calling for sunny, but very chilly weather tomorrow which is a HUGE step up from last year's experience. ;) And let's not forget about the fact that we picked out a ginormous tree last year. Oops. This is one of my favorite videos... Ever. In my defense, I had no idea how huge it would be until we got it in the house. I guess when you're in the middle of a forest full of Christmas trees, the only real comparison is... well, other trees. Christmas Vacation is one of my FAVORITE holiday movies. I crack up at almost every scene!!! I can't wait to see Carter & Brynn Santa Pictures!! Christmas most definitely is not complete without Christmas Vacation! I wish we had a place like Linvilla Orchards, it sounds awesome! Sounds like a fun weekend! Have fun getting your tree, and good luck with Santa :) Can't wait to see the picture! We're taking Jack next Friday. Should be interesting! Sounds like fun. Tree cutting always has to happen on the coldest day of the year, right? I think I remember watching that video last year and snorting coffee out of my nose! Hilarious. 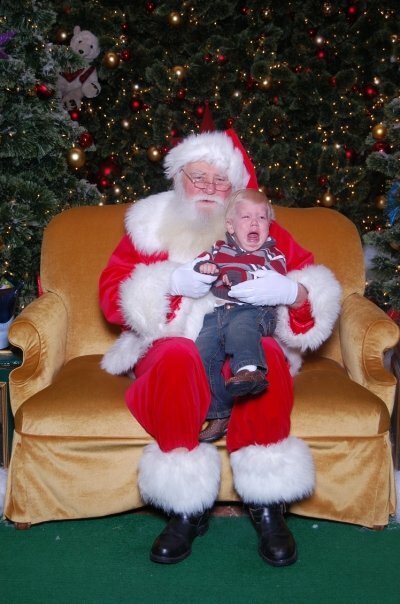 We are also going to see Santa this Sunday. Heading over to good old KOP b/c the MIL claims he is the best one around here. Very interested to see how Mags reacts to the big guy! Oh have fun getting your tree!! I'm missing this tradition this year since we're going away for Christmas, so enjoy it for me too! That video is HILARIOUS! We have a fake tree so it is sized just perfect for our house. ;) Maybe one year we'll brave the Christmas tree farm. Sounds like some wonderful memories will be made this weekend! I joined your blog hop for the first time today. Thanks for hosting! Awww. Poor baby. 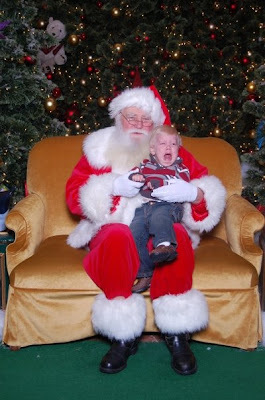 Looks like my santa clause experience with my three year old.